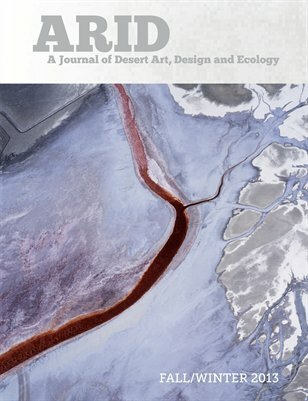 ARID: A Journal of Desert Art, Design and Ecology is a peer-reviewed annual journal focusing on cross-disciplinary explorations of desert arts, design, culture and the environment for both scholarly and new audiences. ARID seeks submissions of scholarly articles, curriculum, visual essays and other media including sound and video that investigate diverse aesthetic, social, cultural, historical, ecological and political subjects related to desert regions of the American Southwest and beyond. ARID emphasizes the convergence of art, design, and culture with science, ecology, geography and other related disciplines to create a unique snapshot of and dialog about desert environs and cultures with a vested and active interest in the desert as a point of creative investigation.ARID is an interdisciplinary online project that was first launched in September 2012. Arid Journal is currently on publishing hiatus until further notice. To peruse our fifth issue, click here.